Pope's vintage Mercedes limo coming to the U.S.
My grandmother still has the program from when the Pope visited San Antonio in 1987. Wert saw him in NYC. 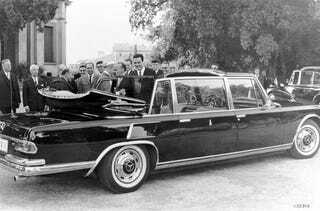 Pope Paul VI's 1965 Mercedes-Benz 600 Pullman limo visiting the Ameila Island Concours isn't, but it's still kind of cool.